Evan Williams Straight Kentucky Bourbon Whiskey follows a heritage of excellence established nearly 200 years ago. 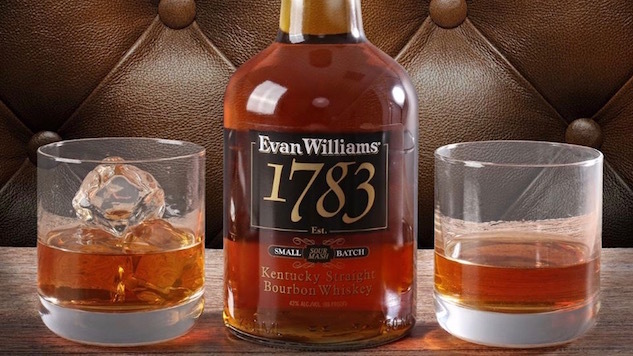 It was in 1783 that Evan Williams founded the first commercial distillery in the area that was admitted into the Union in 1792 as the Commonwealth of Kentucky. The basic processes used by Evan Williams are still employed by our little, family owned distillery. These tradition-laden methods are responsible for the rich, unique flavour of Evan Williams Bourbon. Today’s craftsmen at the Old Evan Williams Distillery feel a keen responsibility to continue the heritage established by Kentucky’s first distiller. The character of this exceptional man endures as an inspiration for excellence. We believe the character of the Bourbon honouring Evan Williams must match the character of the man. When you sip this mellow Bourbon, you are, indeed, tasting a tradition which dates back to the early days of our Republic! Evan Williams was a product of America’s most active and romantic era. He responded to his time vigorously because action was a means of survival. Less active men fell victims to the countless perils of an inhospitable wilderness. Like many early Kentucky pioneers, Williams was a native of Virginia, and, as early as 1774, had started to demonstrate the qualities of leadership which were to mark his life. In the spring of that troubled year, colonists were alarmed by the punitive actions of the British Parliament against the citizens of Boston. Committees of Correspondence were established in each of the thirteen colonies as a means to exchange news and views for response to threats to their freedom. Such Committees were formed in several Virginia Counties and Evan Williams - was elected clerk for the committee of Prince William County. These pointed words were written May 31, 1774 - a year before the Battle of Lexington started the Revolutionary War with the “shot heard around the world”! It was to be expected that such a firebrand personality would naturally gravitate to the wilderness that was Kentucky in the 1780’s. Williams motives for leaving the relative peace and safety of the East Coast are not recorded. But it is very likely that he saw the frontier as an unlimited opportunity for wealth. Thousands of acres of virgin land were available for nominal fees. Fortunes could be made (and lost) in speculation in land warrants. And natural leaders are always at a premium - especially on a rough and tumble frontier. One may be certain Williams’ first attention was the task of keeping his scalp. Indian raids against pioneer Kentuckians were relatively common throughout the 1780’s. The first 3 County Lieutenants of Jefferson County (Militia commanders) were killed by war parties during the 3-year span of 1783 to 1786. The rich Kentucky land produced bumper crops even with minimum cultivation. But getting the harvest to markets was an impossible task. Narrow trails wound eastwardly over steep mountains which accommodated only pack animals. The more inviting route down the Ohio and Mississippi Rivers terminated at New Orleans which was controlled by Spain, a power not totally in sympathy to the American cause. Williams’ experience in Virginia provided a logical solution. The corn and other grains could be converted into whiskey. A single pack horse could carry two 20-gallon kegs, the equivalent of a quarter ton of grain. And, if properly distilled, the resulting product would be more tasty than the raw material! Thus, in 1783, Evan Williams established the first commercial distillery in the present Commonwealth of Kentucky. Williams located it on the east side of what was later to become 5th Street in Louisville. The distillery was on the banks of the Ohio River and near the protection of Fort Nelson, headquarters of General George Rogers Clark and Kentucky’s most important military post. There is no record of an Indian attack against Williams’ property although raids were reported in the area as late as 1791. Williams showed considerable business acumen from his very first “run”. He obviously emphasised quality, knowing full well that others would follow his lead. Many could distil a whiskey but only the gifted few would have the talent to produce a truly superior product. thus a premium whiskey was his practical means of bettering the competition which would inevitable follow. Nature smiled favourably upon his efforts, too. The limestone water in the area imparted a particularly desirable taste (an important reason for the continued popularity of Kentucky-produced whiskies even today). Even the shortage of money conspired to encourage production of whiskey which was used in barter. It was not unusual for the consideration of contracts to be for a stated number of gallons of “good and marketable whiskey”. 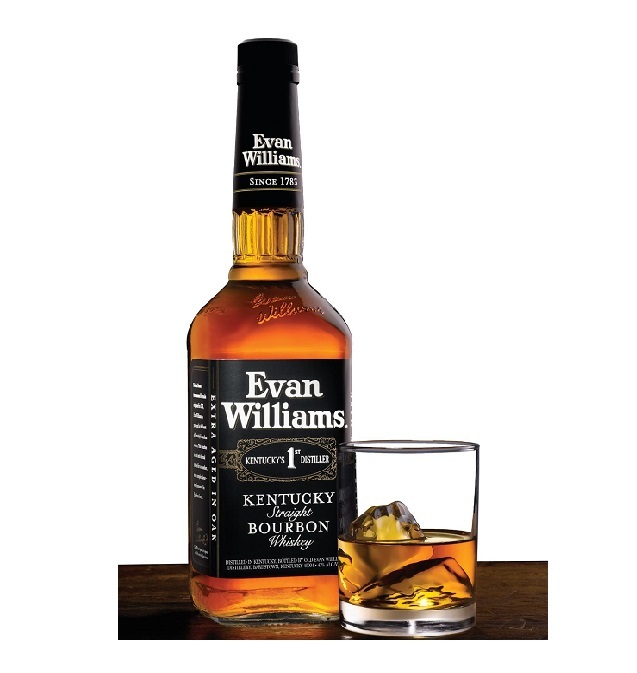 As the distiller, it is logical that Evan Williams’ product was used as a standard for quality. Williams’ reputation for honesty and fair dealing made him a natural leader in the community. Although the Town of Louisville had been established in 1778, its Board of Trustees was relatively inactive. Citizens seemed to have a natural distrust of government, the man who was attracted to the frontier tended to be a rugged individual who depended upon his abilities instead of collective action. The Board, which was appointed by the Governor, had little authority and tended to relatively inactive. There are no records of it even having met between 1793 and 1797! An Act of the Kentucky General Assembly in the latter year, however, expanded the power of local government and called for the popular election of the Board of Trustees. Evan Williams was one of seven selected by citizens to serve on the newly created Board. One needs little imagination mentally picture the celebration which followed that event and the toasts which must have been made with Williams’ finest stock of whiskey! Evan Williams was well known for his hospitality and surprised no one by bringing a jug of his whiskey to the first meeting. Neither the Chair nor other members officially acknowledged the refreshments but it was reported that Williams left the meeting with an empty jug. At the next meeting, however, Gabriel Johnston demanded that Evan be censured for bringing whiskey and that the bottle be confiscated. Williams agreed to the ploy, even though it was technically in error. Immediately after adjournment, each member, in turn, tasted the whiskey. When it came to Johnston’s time for taking a dram, he declared it “was too mean to be drunk” - a cutting insult to a proud man such as Williams. But Evan was equal to any debate. He countered that Johnston had “sissy, aristocratic tastes” - strong words in the era immediately after the Revolutionary War! Besides, Johnston could have been planning to open a competing distillery and his criticism merely the start of propaganda warfare against an established firm. Obviously Williams defeated the effort. The brand bearing his name is a favourite even today while Johnston is lost to history! Later Board action included the appointment of Williams to the important post of Harbour Master. Louisville, located at the Falls of the Ohio River, was a major port for water traffic. Boats were unloaded above the Falls and freight carried overland below that obstacle to be reloaded for shipment to New Orleans. The harbour, located in Beargrass Creek, was small and had to be careful supervised to avoid over-crowding. The rules governing the harbour were very specific - boats had to be unloaded and moved out of the harbour within 48 hours after their arrival. The Harbour Master was required “to set afloat” any boat failing to comply - a regulation which was certain to create ill feelings to all except the most skilled diplomat. He was also the contractor responsible for many major projects, including the Jefferson County Jail which was built under his supervision in 1802-03. The Marriage of Evan and Hannah Williams was blessed with five children, 3 boys and 2 girls. As so frequently happened in those days of limited medical knowledge, only 3 of the children survived to adulthood. Evan Williams died on October 15,1810, in Louisville. The skill which he developed in the art of distilling superior whiskey, however, continues and has been passed down through generations of men who are dedicated to excellence. This tradition is very much alive in today’s Old Evan Williams Distillery. His memory will exist so long as mankind prizes exceptional quality. Things really haven’t changed much at our small, family-owned distillery since the days of Evan Williams. Oh, sure, cool spring water is pumped to the still-house instead of being carried a bucket at a time and a few other labour-saving machines replace muscle-power for some tasks. But the basic distilling process would be quickly recognised and understood by Evan Williams. He would applaud our selection of only the best grains because this follows his 200 year old policy. And he would appreciate why we have maintained such a small distillery instead of mass-producing the Bourbon that bears his name. This allow us to give attention to small but important details; to carefully nurture the whiskey through each step of production. Would you want to change such a tradition? Beat eggs with sugar until light & lemon coloured, add flour. Beat again. Add buttermilk with fat particles intact. Add Evan Williams Bourbon. Pour into baked pie crust; dust with nutmeg. Return to 375º & bake until filling just sets. (20-30 minutes) Serves 6. Cream butter with sugar, add egg yolks, then sugar cookies, dates and pecans. Add whiskey. Whip egg whites until stiff, then fold in. Pour into greased pan and bake for 30 to 40 minutes at 350º. Cool. Cut into squares and top with whipped cream. Serves 12. Fold yolks & whites together after beating, adding powdered sugar & spices. Put 2Tbls. of this mixture in each Tom & Jerry mug. Add jigger of Evan Williams Bourbon and ½t. of warmed rum. Fill mugs, with boiling water, stirring as the water is poured. Serves 12.